The San Diego State men’s lacrosse team went up against one of their rivals on Saturday, losing 13-9 against the University of Arizona. The Aztecs men’s lacrosse team welcomed Arizona’s Wildcats over at the Mesa in what was a very anticipated game. Arizona came into the game with a 2-2 record and the Aztecs came in to the day at 3-2. SDSU came out firing quickly taking a 4-0 lead just 4 minutes into the first quarter. Junior Pat Greene scored three of the goals and assisted on the fourth. Arizona was able to adjust to the Aztec offense and eventually go on a 4 goal run of their own ending the first quarter at a 4-4 tie. Arizona took a 7-4 lead into the second half. The offense continued to look flat starting the second half as bad turnovers and missed shots began to pile up for the Aztecs. They were finally able to break through towards the end of the third quarter but Arizona answered with two quick goals making it 9-5 heading to the fourth quarter. The Aztecs offense finally started to click after Arizona was given a 3 minute non releasable penalty early in the fourth. SDSU scored 3 goals on the man up advantage cutting the deficit to just one. A few minutes later Junior Ben Borglin ripped a shot beating the Arizona evening the score at 9. After they tied the game the Aztecs started to play undisciplined, leading to bad penalties and Arizona was able to capitalize scoring 4 unanswered goals of their own. Arizona would hold on to this lead and ultimately beat the Aztecs by a final of 13-9. After the game Junior captain Pat Greene had this to say about the loss. The Aztecs are now 3-3 on the season and will be on the road for two critical conference games this weekend. The Aztecs will take on Claremont on Saturday and Concordia Irvine on Sunday. Concordia Irvine is led by former Aztec Coach Jesse Foss and are currently ranked 5th in the MCLA with a 5-0 record. By simply creating playlists, you open yourself up to the exploration, beauty, & the truth behind musical identities, just by categorizing music. Whether we realize it or not, we as humans naturally attach a specific feeling or emotion to every song we listen to. While everyone’s interpretation may be different, most of us would agree that we subconsciously associate different genres to certain personalities. When we find a new song that we enjoy, it might seem as if we’ll never get enough of it. For me personally, even if I hear a song that blows me away, I am still craving more. We constantly desire new stimulus, and the moment I find a new sound to obsess over, I start to search for more. This is where playlists come in and change the “music-searching” game entirely. With the advances of streaming services like Spotify and Apple Music, finding new music is as easy as ever. While users can easily find “suggested songs” playlists from their favorite artists, I wanted to highlight the beauty behind making playlists and listening to mixtapes and playlists that were made with passion. In the summer of 2017, I joined my family in upstate New York for fourth months, working two jobs and spending time in a small town in which I had never lived before. Since I spent most of my days alone, SoundCloud became my sanctuary. The concept of organizing music into niche categories was fascinating to me, and making playlists every week turned into my own form of self-expression. I wasn’t necessarily making them for anyone but myself, but I hoped that maybe someone would appreciate a group of songs the same way I did. When I find a song I deeply connect with, I find it nearly impossible to keep it to myself – sharing music with others allows me to enjoy the song fully. This was the same summer that I decided to join KCR. I thought that if I could combine my love for playlist making with my passion for sharing music, I might find a bigger sense of belonging on this campus. Now, with this being my fourth semester in KCR, I can confirm that this passion has not fizzled. Most of my playlists are created after I’ve found one song that I refuse to take off repeat. I try to pay attention to a specific feeling that I gain from listening to that song, and then find others that parallel that feeling. Some of my favorite playlists that I’ve made over the years can be found on my Soundcloud, like “Lets go watch the stars together,” a playlist I created one summer night after listening to soft beats that reminded me of star gazing with someone special. Others include “Ode to Porter,” which I made in tribute to Porter Robinson’s unique sound, and “Gooey,” a selection of electronica songs that make me smile and my insides feel “gooey,” so-to-speak. I have recently begun to make the switch over to Spotfiy, where I’ve made playlists like “Aquarius,” featuring my favorite indie songs of the season that make me feel like sunshine. Music has the power to heal and inspire, and that is something special to talk about. I encourage everyone to make a playlist of your favorite songs and see how it makes you feel. While most of this may seem like common sense, I enjoy dissecting the concept and believe that making playlists can be used as a form of self expression. 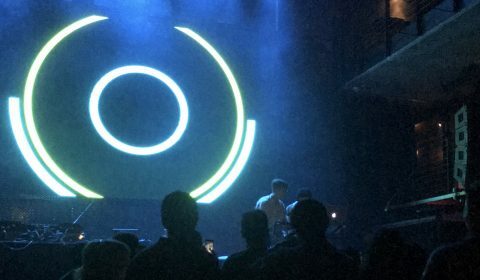 The SwuM/TVBOO show at Music Box was a bass thumping, energy-inducing high of good-vibing music. Held at the Music Box in downtown San Diego, the show catered to people of all ages, but targeted the young in the community (18+, although I did see a couple 12 year olds running around). Although the advertising mainly promoted SwuM & TVBOO, there were several opening acts consisting of talented/young DJ’s & musicians who are breaking into the industry. I am proud and honored to say that not one, but two of my coworkers performed that night and amazed myself and the audience with their immense skill. Doors opened around 7pm and people flooded in ready to experience a great environment. The venue itself had a bar for those who were of age, and a merchandise shop to pull in some extra revenue. While there was little to no sitting room (not including VIP), it was not really needed as the crowd preferred a more open area to jump along to the bumping music. Kastro opened the evening as the venue opened to the public, and introduced us to the wonderful evening and mood that would be set for the evening. My coworker, Domoniqxe, went on next and showcased some amazing original compositions that the crowd really enjoyed. She then handed the floor to Lydon (another coworker of mine) & Zuma who really got the crowd moving with some bass-heavy mixes. Both of them served as DJ’s as well as MC’s and worked well with one another. From there, there were a few more wonderful openers before the main acts came on stage. SwuM is notorious for the lo-fi genre and catered to audience seamlessly. TVBOO is a more hype edm/dubstep type artist and was saved for later in the night. Some people only went for the latter of the two as TVBOO creates a different atmosphere than SwuM. Having the two perform in the same night was a good move though because electronic artists have such a wide variety of fans that can vibe together. All in all, it was a wonderful show made possible by talented artists, dedicated people, and a great venue. I hope to see everyone artist again in the future, maybe even on a bigger stage. A major shoutout is also in order for Lydon & Domoniqxe as they publicized the event to a large majority of San Diego State University students.